I know it might sound crazy but I had never heard of a rice bag until I moved to Washington and my mother-in-law introduced me to them. I never really had much of a need for one until I was married and started having kids then suddenly I had a million reasons to want a rice bag. In fact, I love DIY rice bags so much during pregnancy that I have them listed as one of my pregnancy must haves! Pregnancy aside, rice bags are wonderful for those achy shoulders, cramps, restless leg syndrome, growing pains, and so much more. 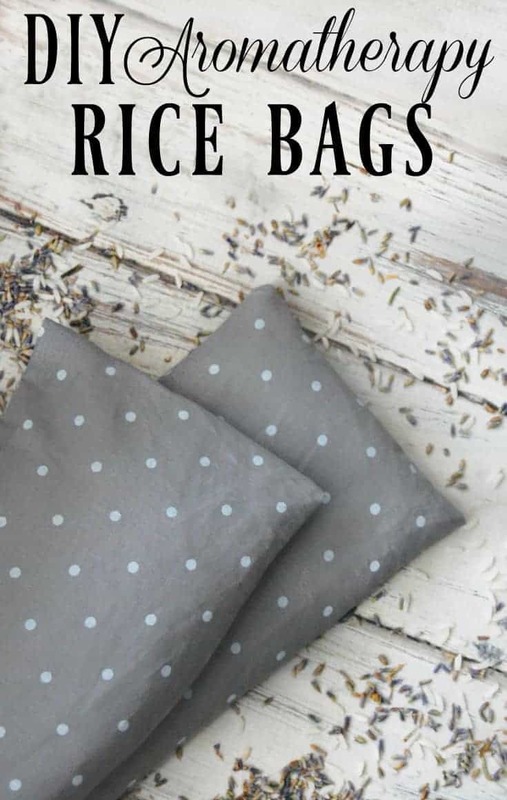 Just plain rice is great and it’s what I’ve had for years now but you can also go one step further with an aromatherapy rice bag. A DIY aromatherapy rice bag or even just a plain rice bag is a must have for any “medicine cabinet”, pregnant mama, sick kiddo, or as a great gift. Don’t be intimidated by the homemade aspect of these rice bags. Learning how to make a rice bag is so easy! They are probably the simplest thing you could sew. It’s very simple and very forgiving as most of the seams are completely hidden! Fold fabric with right sides together. You will now have a rectangle that is 6×20. Turn fabric right side out. You can also iron the fabric at this time if you would like but I don’t bother as wrinkles will disappear as you heat up the rice bag. 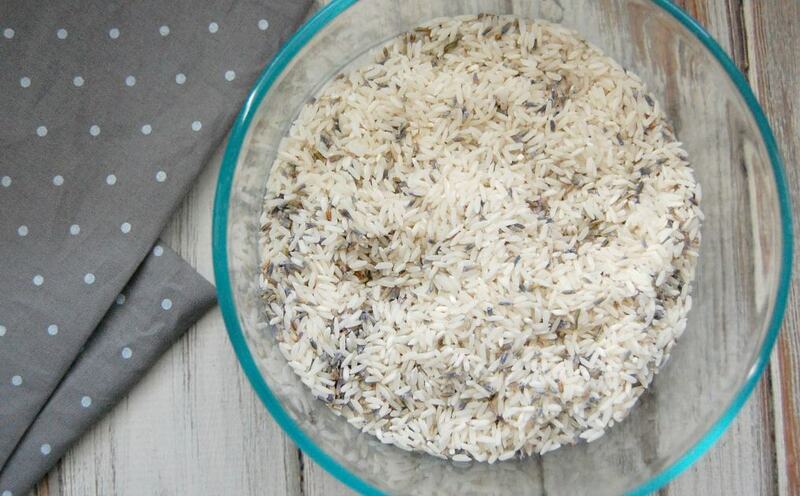 In a bowl, combine rice with your aromatherapy option. Mix well. 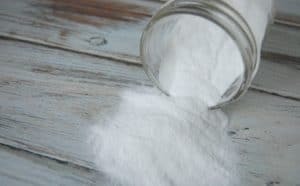 I found many sites saying to let the rice absorb the scents (particularly essential oils) for one day before filling the rice bag but odds are you can also fill immediately with no harm. 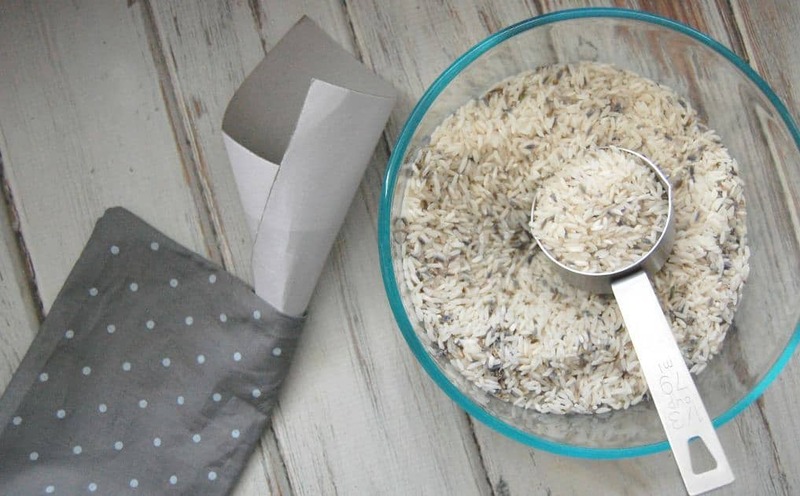 Insert a funnel (or paper funnel) into fabric bag and start filling the bag with rice. Fill bag halfway with rice. I’ve found that you need about 6 cups of rice for this size rice bag. Once your bag is half full with rice, remove funnel. 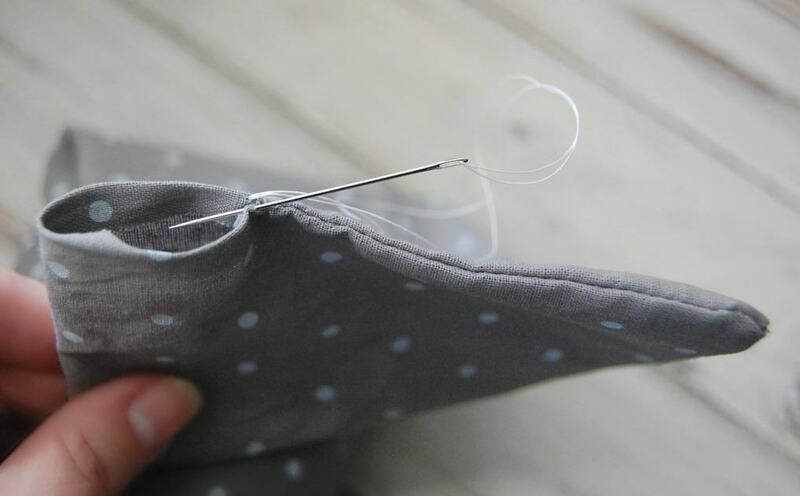 Fold the raw edges of the “hole” so that it lines up with the sewn edge. 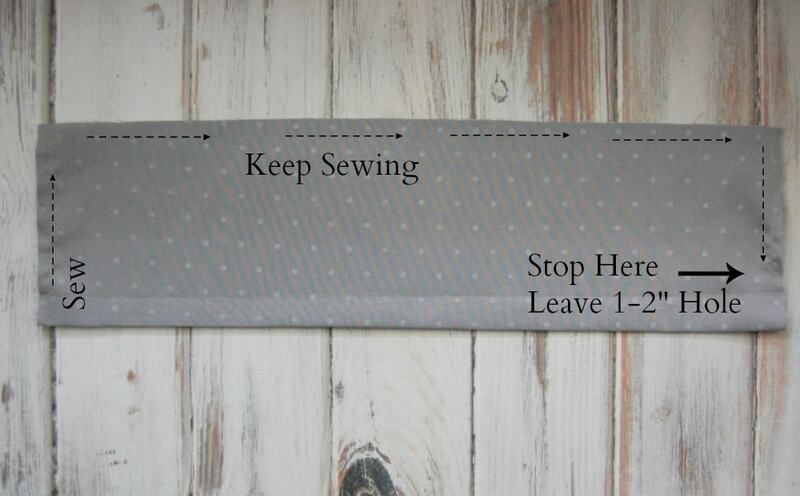 Now sew the hole closed. 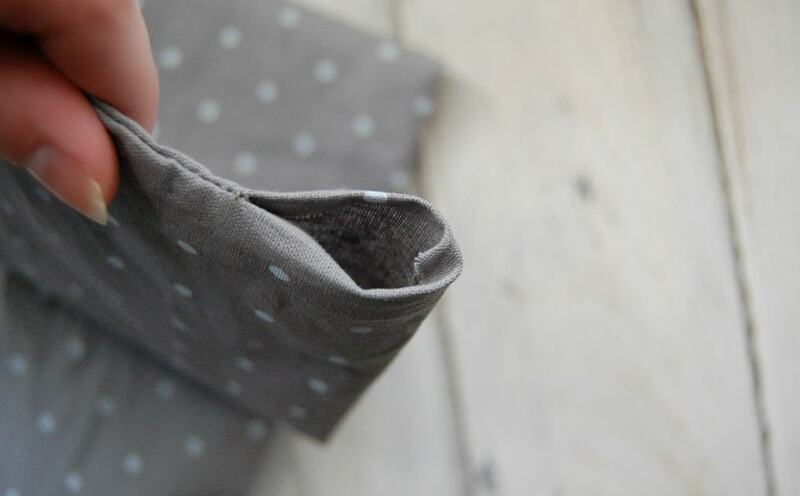 This looks best if you sew by hand so that seams are hidden but I’ve been known to just run it under the sewing machine for a quicker method… granted I usually only do that with my personal bag; I like gifts to looks a bit prettier. I’ve also heard you can heat up a rice bag in the oven at 200 degrees for about 15 minutes but make sure to check on the bag often. Place in the freezer till cold and use as an cool pack. Cinnamon – 3-4 tbs of cinnamon chips. Spice – 3-4 tbs your favorite spices – I love a mix of cinnamon, clove, and ginger. Any scent will really work. You can open up tea bags and use those (I just did a spiced chai), any essential oils, any herbs will likely work as well. Thank you for the step-by-step instructions. Great gift idea! I made sure to give you credit since your tutorial helped me along. Does the dried lavender loose it’s scent after a while? Yes. Dried lavender (and even lavender essential oil) will not stay forever. I’ve been known to add a drop onto my rice bag after heating just for a nice scent but since that’s just on the bag, it has no staying power. Hello. 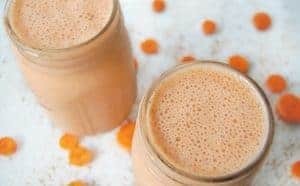 I am going to make these to help with my migraines. The only thing I’m worried about is the oils on the rice & then putting it in the microwave. Does it effect the oils at all by doing that? Thank you. It shouldn’t effect the oils for this use. If you were applying them topically I might be more concerned but this is essentially for scent. Hi many people use wheat for heat bags is there much difference using rice of wheat? Can you tell me ratio oil to rice? Like it’s that 1-2 drops per pound of rice? For my size of rice bag, I used 6 cups rice and it was probably 4-6 drops of oil. 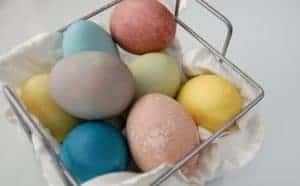 Since microwaves change the makeup of everything that goes into one, including WATER, I suggest you warm these up in your oven. I don’t even have a microwave anymore, after reading many articles on their harmfulness. The essential oils WILL be changed after using a microwave, as will any filling (rice, etc.) so be safe, and use an oven instead. Generally I would agree with you about the microwave use…. but these rice bags are not for eating so I do not think the changes made to the rice prove a concern… Possibly the essential oils might but since the EO’s are not being applied to the body I think it’s likely still safe. I have used these rice bags for over 5 years. They still work wonderful, and I always use the microwave. They still smell like ground cinnamon when heated. Just beware…you might get a hankering for homemade rice pudding when using these. YUM! Does the rice ever lose its ability to hold the heat? And how long would it be before it loses the fragrance? I just made mine! Super easy. Took it for a test drive [added some eucalyptus oil and did not wait overnight for it to dry] and it’s lovely! I might make the next one a bit longer by an inch or two so it drapes over the shoulders. The width is perfect. Just to let you know: the finished product looks like a sack of rice…which it is, of course. But if spreads out naturally when you wrap it around your neck. My other thought is sewing compartments [maybe two] to evenly distribute the rice. Re the cinnamon option, do u mean tablespoons or teaspoons? Bc tablespoons seems a lot!!! I suffer from nerve damage in my left leg from sciatica, had lower back disc surgery, but after a year my leg still bothers me, especially at night, I have to get up from a sound sleep and walk around to get my calf and foot to stop cramping so severely, and that’s only temporary, I’ve recently started putting eucalyptus oil on my leg b4 I go to bed, but can’t comment on how much benefit I’ve gotten from it as of yet. I would like to have something like the rice bag I could apply directly to the problem area. You can add it to the bag… although I find that doing so usually results in oil marks on the bag. Won’t worms and insects start to grow in old rice grains inside the bag? No. This is dried rice so there’s very little chance of insects to begin with. And on top of that, you are occasionally microwaving the bag when using it so that would kill any living things in the rice. What oil do you suggest for restless legs? I suffer nightly with this. 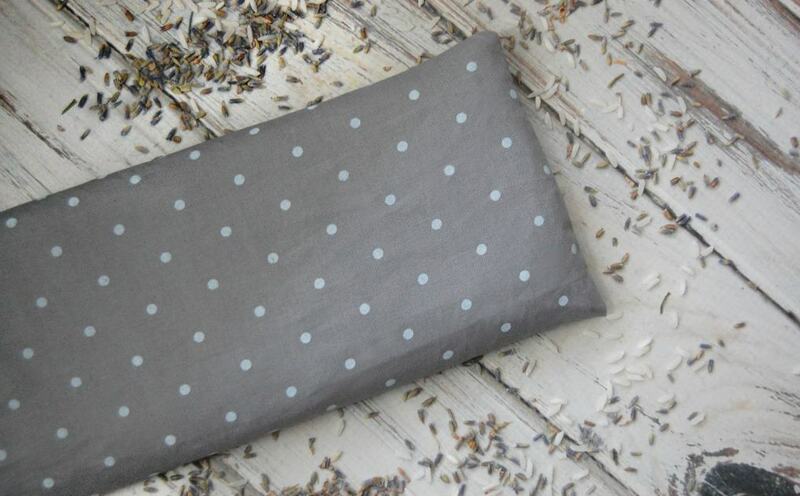 I don’t know that adding an oil (or herb) to the rice bag will help with restless legs but… lavender is very relaxing so that might be a good choice. I LOVE these rice bags. For years I have used them and have had no problem. I started out with a rice bag that was given to me well over 5 years ago and it had Lavender. Then as the smell faded I actually opened the bag where it was hand stitched and added a few drops of Lavender EO and sewed back up again. Super easy! And yes these are wonderful gifts for male or female. The only suggestion I have is to measure around your neck and add a few inches down so that you can have one that hangs and stays put. Thank you for sharing!!! I can’t wait to make some rice bags for my dogs’ beds this winter. I love all your fragrance suggestions. Also, Step 8, change Your to You’re! Your instructions were great to use for making an eye covering with rice for my husband who finds the eye masks uncomfortable. Thanks !! What are the cleaning recommendations for these? I want to make one for my little girl and I want to make sure I know how to clean it just in case. Hi Brittany. I agree… do not try and clean them. I did that once. Just once because it ruined my bag. Anyway, I want to make my own. I looked at the picture of the rice in the instructions, but can you share with me exactly the rice that’s best to use? Thank you! Any rice will do. 🙂 I usually use long or medium grained rice but it all works about the same. I would like to make some ipax using flaxseed and peppermint leaves. Have you had any experience with this and how much peppermint leaves do I add to the flaxseed? I’ve definitely heard of people using flaxseed but I’ve yet to try it. Based on how much herbs I usually include, I’d say 3-4 tablespoons fo dried peppermint leaves per bag.